Anyone can tell you if a trailer "looks good" or not. But Drew Magary, who spent over a decade working in advertising, is here to tell you whether or not a trailer WORKS. This week's trailer? "Frankenweenie". When you encounter a movie titled "Frankenweenie," what do you think the odds are that said film will be directed by Tim Burton? A million percent? It was either gonna be Tim Burton or John Waters, and you knew Burton would win out in the end. 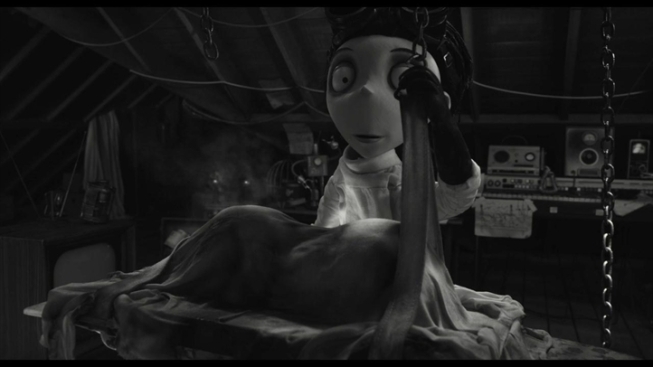 "Frankenweenie" represents something of a homecoming for Burton. This is actually the first movie that Burton ever made, way back in 1984. And Disney decided to give the director a chance to remake his own movie, which might be unprecedented. I wonder if Martin Scorsese will get $60 million from Disney to remake "Who's That Knocking At My Door?" Anyway, this revived "Frankenweenie" will be a stop-motion animated film (the original was live-action) and it's gonna be in 3D. Just how the old horror movie goth guy would like it. Let's watch the trailer and answer a few questions. Does this trailer let us know what the movie's about? Very much so. Seems little Victor Frankenstein has lost beloved dog Sparky. He is very sad (and you are too, because only a heartless monster would be unmoved by a dead dog). Then, his mom makes a passing comment about bringing him back, and suddenly Victor is struck with inspiration. He takes the dead doggie to a secret lab, raises it up to the heavens, watches as it's hit by lightning, and PRESTO! Zombie dog! WHAT COULD POSSIBLY GO WRONG? Why is this movie in black & white? It's an homage to "Frankenstein," you silly billy. Did you not see "The Artist"? Making movies that look like old movies is totally the new thing. Everything here sure looks a lot like "The Nightmare Before Christmas." That it does. It's the same animation, and the characters all have the same big heads and tiny noses. If "Frankenweenie" is good, it could end up a beloved classic like "Nightmare." If not, "Corpse Bride." Either way, it's Burton waving his goth flag in your face once again, screaming, "I'M WEIRD!" Wait, how is Johnny Depp NOT in this movie? I know! I'm as shocked as you. Instead, you get the vocal stylings of Burton vets like Catherine O'Hara, Martin Landau, and several others. It's very warm and comforting, except for all the amputated dog parts. Is that kid who looks like Igor a real kid, or a zombie kid? TBD. Does this trailer work? It does. Most of the trailer concerns Victor's love for his deceased pet and his efforts to reanimate him. And the extended sequence where Victor thinks his experiment has failed and weeps for his old buddy is legitimately touching. There's a depth here that's really hard to communicate in a simple trailer, and it's clear that Burton is pouring his heart and soul into his old project. When Burton hits ("Edward Scissorhands"), the results are usually pretty stunning. This looks like a fairly solid bet.